15 years on, and now with the ES2-like ES-B pickup, the 2015 Big Baby is better than ever. An excellent introduction to Taylor, and an ideal second, starter or traveller guitar, too. Strong, clean Taylor tonality. Balanced plugged-in sound. Excellent build. Great value for a USA-made electro. The screwed-in neck means no heel - good for access! Time flies, eh? It's hard to believe that Taylor's diminutive three-quarter-size Baby was introduced back in 1996. It's a much copied 'travel' or 'mini' guitar that is arguably more relevant today thanks to the likes of Ed Sheeran. 'But he plays a Martin,' you say. Yes, a small one, and this year Martin launched the Dreadnought Junior, which, with its 15/16th size is, ahem, rather similar to the Big Baby. Taylor hasn't rested on its laurels, however, and for 2015 the Baby gets an optional electronics upgrade to the ES-B system, which employs a pickup very similar to the ES2 pickup rolled out on Taylor's 2014's 800 series. "The guitar uses the ES-B pickup," Taylor tells us, "which, while it does have elements of the ES2 design, it is not completely identical." 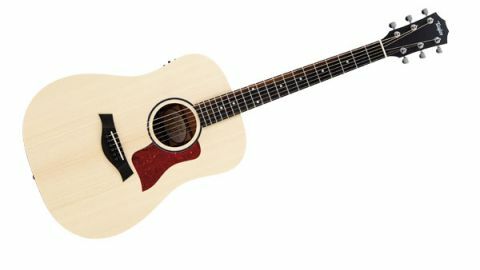 "The 2015-spec Big Baby remains shockingly minimalist, especially alongside a pair of new 600 series Grand Concerts"
When the Baby model launched, especially the Big Baby, many guitar watchers wondered just how much more basic an acoustic guitar could be. Not everyone liked the aesthetic. There's no binding on the body or neck, so the neck is secured to the body with two large, visible cross head screws between the 15th and 16th fret. Also, the layered (laminate) back is arched, meaning no back braces are necessary; there are only minimal linings. Yet, for many, the Big Baby remains a near bomb-proof working guitar, perfectly fit for purpose. Viewed today, the 2015-spec Big Baby remains shockingly minimalist, especially alongside a pair of new 600 series Grand Concerts. But while they retail around £2.8k, our electro BB Taylor-e costs, at full retail, just a smidgeon over £500. The 15/16ths size is only subtly smaller than Taylor's standard dreadnought: 381mm (15 inches) as opposed to 406mm (16 inches) wide and 102mm (four inches) deep compared with the full-size dread's depth of 117.5mm (4.625 inches). Both have 14-fret neck joins and share the same 648mm (25.5-inch) long 'Fender' scale length, although the BB's nut width is spec'd at 42.9mm (1.69 inches), narrower than the 44.5mm (1.75 inches) of the dreadnought. The neck itself seems over-long and skinny, a mainly visual construct as there's no heel. It's screwed directly onto the neck block, the two screws highly visible but unobtrusive to the finger. The lack of heel means high fret access is rather good for a non-cutaway guitar. There's no synthetic fingerboard material here, just a slightly brown- streaked ebony with perfectly fitted and fettled frets. The spruce top has strong, quite wide striping; the sapele/ poplar/sapele layered back and sides is a light, rather bland mahogany colour. Despite the absence of binding, the cream-coloured poplar centre lamination creates a binding-like stripe around the edge. For our test, we have a well-used example Big Baby from 2006 for comparison.You can see a few slight indentations around the unbound edges but the primary visual difference (aside from the early laser etched rosette decoration, which lacks the bold contrast of the current black-centred ring) is the colouration. While the new, natural BB looks rather bland, the older one has aged to a rich amber colour (even the nut and saddle have adopted a nicotine hue), and the ultra-thin satin 'varnish' finish has burnished to a deep, lustrous gloss, especially on the neck back. Rather nice. Only subtle changes have been made to the Big Baby over the years, yet the neck shape seems slightly more grown-up. There's less of the earlier edge as the shoulders roll into the fingerboard, and we understand that the top has been ever-so-slightly reduced in thickness. "Put simply, it's a league above virtually all of the similarly priced electros we've listened to recently"
We imagined the well-used older BB would give it the edge tonally, but we're wrong. The 2015 guitar has a little more looseness, depth and give. Acoustically, yes, it has quite a hallmark Taylor tonality: strong, clean and quite brightly voiced with a condensed bass end. On the one hand it lacks the complexity and subtltey of a higher end all-solid wood Taylor, but, conversely, its strident projection and trim-for-a-dreadnought low end make it sit very well in a mix, both in the studio and live. The ES-B is a very well sorted pickup that really doesn't sound very piezo-like. The three piezo elements sit behind the saddle, not underneath, and can be adjusted to balance the response. It's paired here with a small side-mounted preamp with a pretty accurate tuner and simple volume and tone controls (think treble roll-off ). It's very clean, very balanced, and straight into a flat channel and outboard EQ it produces a very good modern sound. Yes, the bass end is a little clouded for fingerstyle and the new-string highs can be a little crispy, but, put simply, it's a league above virtually all of the similarly priced electros we've listened to recently. Dimensionally, it might only be subtly smaller than a full-size dread, but it certainly feels noticeably more compact played seated. Bare bones? Yes, but all the essentials - not least great intonation paired with electric-like playability - are present and correct. If you appreciate quality but don't like or can't afford a 'posh' guitar, then you should try this 2015 Big Baby electro. We'd be more than happy to take it on a gig, especially with a band, though an experienced player may want a little more for intimate solo shows. Regardless, it's a highly contemporary sound and, full scale, really suits drop and altered tunings. While it doesn't sound like an old Martin dreadnought, there's a directness and purity to its voice that is highly credible.